We’re getting pretty excited about the new Disney movie Lemonade Mouth. And if you like High School Music or Camp Rock then you should be getting excited too! Out on the Disney Channel on 16th September, Lemonade Mouth is all about five high school students who form a band when they meet in detention, helping them stand up for their beliefs and get through their own struggles and those as a group. Lemonade Mouth has already become huge in the US – becoming the number 1 US Cable Movie in 2011 and number 1 soudntrack on iTunes – so we’re expecting big things! We chat to Disney star Bridgit Mendler! The other week we brought you the first official trailer, and to tell you even more about what you can expect, we caught up with one of the film’s stars Blake Michael! 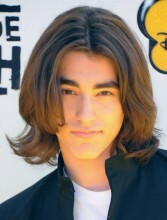 You play Charlie in Lemonade Mouth: tell us what he’s like? He’s laid-back – he’s a drummer. He’s also from a wealthy family so he wears cool clothes. He has a huge crush on Mo, too, all the way through the film. Charlie sometimes has trouble making decisions, though, as you’ll see! The characters in Lemonade Mouth meet in detention: did you ever have to go to detention at school? Well, I was home-schooled after 3rd Grade. But before that, I definitely had my moments. I’ve definitely been to the Principal’s Office a few times! What does Lemonade Mouth have that rival band Mudslide Crush don’t? Lemonade Mouth is cooler, we have better songs! And Mudslide Crush are musically quite good but the 2 guys are complete jerks and they wreck our sets all the time! How old were you when you started acting and singing? I was 3 when I started acting, but I only started singing a few years ago. How long did it take you to learn how to play the drums? My dad was a drummer so I’ve always been around drums and I’ve been able to get a basic idea of how it’s done. I learnt properly on set, though, and it probably took a couple of months. You can act, drum, sing… is there ANYTHING you’re bad at? I need to get better at singing I think, I haven’t been doing it that long. Would you rather spend the day with a girl you like, or spend the day playing drums? You’re a bit of a hero in this film, what’s the most heroic thing you’ve ever done? I haven’t saved any kids from wells recently… but I do sometimes help rescue dogs from the street. What’s your favourite song from the film? It changes every day… today I love ‘Determinate’. It’s a great song with a really cool dance routine. Would you rather have a bath in lemonade or eat your way out of a massive jelly? That’s a tough one, both sound delicious! The movie’s been MASSIVE in the States: do you ever get chased down the street now? Yeah, sometimes! Fans always come up to me when I’m out rollerskating with my friends. I love talking to the fans, though. I love hearing how Lemonade Mouth has inspired them. Do you get on with the Lemonade Mouth gang off-camera as well? Absolutely! The moment I met these guys, we just hit it off straight away. We still do lunch sometimes now. Do you ever pull pranks on set? Oh yeah. I’m definitely a prankster. I love doing prank calls. What’s your favourite Disney song of all time? Back in the day I had a HUGE crush on Miley Cyrus – so anything from Hannah Montana! How much lemonade have you drunk since doing the film? To be honest, I drank so much lemonade on set, that I’m lemonaded out! LEMONADE MOUTH premieres on Disney Channel UK and Disney Channel HD on September 16th. The DVD is out September 26th. The soundtrack featuring the track “Determinate” is out now. Lemonade Mouth coming soon to the UK!